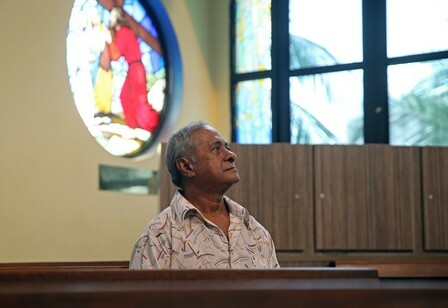 Henry Leo, 72, a devout Catholic, is photographed at the Church of St Michael. 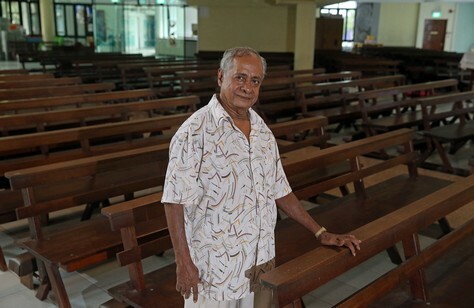 Henry Leo, 72, knows the date Singapore separated from Malaysia. On the morning of Aug 9, 1965, he was in the kitchen of a house in Bendemeer listening to the radio when an announcer read the proclamation declaring the island's independence. But he does not know his date of birth. Or his real name. Or his ethnic origins. Or who his parents are. Or if he had siblings and if any of them are still alive. His is a unique Singapore story, as sad as it is touching. Sitting in an old cane armchair in his four-room HDB flat in Ah Hood Road, the soft-spoken man reckons he was born in 1942. His family, or so he was told, was killed during the Japanese Occupation. Asked if he has any recollections of them, he smiles and shakes his head. "I don't remember anything about my family or what happened to them. I was too young," he says. 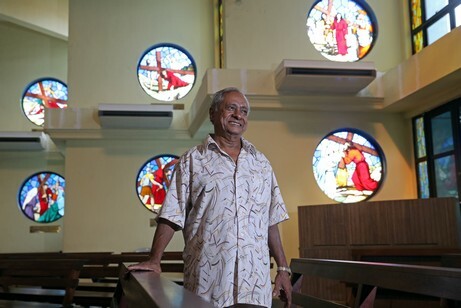 Father Michel Olcomendy, the first archbishop of Singapore, apparently found him on the streets and put him in Aljunied Convent, a home run by Canossian nuns. Mr Leo's memories of the home - where he remained for a couple of years - are hazy. Father Michel Olcomendy, the first archbishop of Singapore, apparently found him on the streets and put him in Aljunied Convent. "It was a very simple life. There was a routine, a time for lunch, tea, dinner and prayers. Some of the nuns were Chinese so I learnt some prayers in Chinese," he says. His life took another turn in 1947 when he was adopted by Leo and Hilda Campbell, a Eurasian couple who sailed to Singapore from Sri Lanka in 1910. They were Dutch Burghers, Eurasians usually of mixed Dutch, Portuguese Burgher and Sri Lankan descent. The Campbells lived in a big house in Serangoon with their eldest daughter and son. They had three other daughters who were married and had their own families. "They needed a houseboy," Mr Leo says, describing the house as beautiful - with verandahs, corridors, four bedrooms, servants' quarters, a big kitchen as well as a fireplace with a chimney. "There was a huge garden with lots and lots of trees - durian, rambutan, duku, chiku, jambu, coconut, papaya. They grew everything there including pineapples. And they reared chickens, ducks, turkeys and geese," he recalls. Then seven years old, he was given Mr Campbell's first name as his surname. One of the daughters decided that he should share the same birthday as matriarch Hilda: Oct 5. As the servant boy, he slept in the hall on a mat with a pillow and blanket and had his meals in the kitchen. His day began at 6.30am. After breakfast, he had to scrub, clean and do many chores. "I had to clean the chicken pens, cut firewood for cooking, de-husk coconuts, grind spices," recalls Mr Leo, who speaks fluent English but is illiterate because he never went to school. He also learnt to fix leaking roofs, repair furniture, sew curtains, arrange flowers and tend to trees and plants. "In those days, cows would come into the garden and poop. I had to gather the poo and put it on the orchids," he says with a laugh. Every Christmas, he had to mix lime powder with dye and water to make paint so that the walls would get a new coat. The Campbells trained him to be a consummate cook. His repertoire is wide and varied - from s'more (a braised meat stew) to breudher (a soft bread). In fact, he is a repository of many Eurasian recipes now almost lost, including black curry. "It is a type of pork curry. The curry powder has to be roasted until it becomes black but not burnt." When he did wrong, he would get smacked. "I was sometimes naughty and would steal money or use my bus fare to the market to play tikam," he says. Usually offered in provision stores, the traditional game gave players a shot at winning prizes through numbered tickets. The Campbells lived in the Serangoon house for about 12 years until they sold it in 1960. They then moved to a much smaller house in St Barnabas Lane in the Bendemeer area. By then, one of the daughters had been widowed, and moved in with her three children. With so many occupants, Mr Leo had to sleep in the space under the house which was raised off the ground on sturdy pillars. 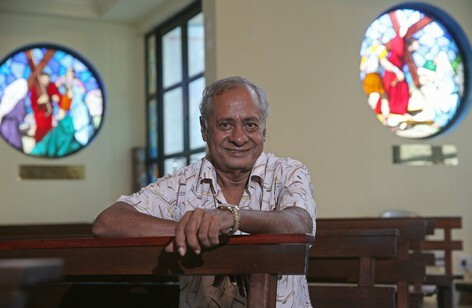 The early 1960s, he remembers, was a tense period in Singapore. "The PAP had come in and the situation was bad with them and the communists," he says, alluding to the political battle between the People's Action Party and the leftist Barisan Socialis. "The family decided to migrate to Australia, and had their papers approved but I was not allowed to go because I was Indian and did not have English or Irish blood. They did not tell me what they were going to do with me." But the plan to migrate was aborted when Mrs Campbell was felled by a stroke and died in 1963; her husband died five years later. In 1970, when he was 28 years old, Mr Leo decided it was time to strike out on his own. On a friend's recommendation, he left to work as a cook and houseboy for the Klasses, another Eurasian family, in Telok Kurau. "They knew I could cook and was good with my hands and handy with carpentry," he says. The Klasses paid him $120 a month and CPF, gave him his own room and a day off each week. As the Campbells only gave him pocket money, it was the first time he earned a proper salary. After a few months, he visited Bernice, the Campbells' eldest daughter. "She had always been very good to me and often stood up for me." He found that the household seemed lost without him, and because he felt sorry for Bernice, he returned to the fold. "Bernice started giving me a salary and CPF. She also opened a POSB account for me," he says. She let him take up odd jobs such as cleaning, painting homes and gardening for other families. In 1982, the Campbells moved to a four-room HDB flat in Ah Hood Road. Not long after, Bernice's widowed sister and her children migrated to Australia. "Many people asked me then why I didn't get a job, earn decent money and lead my own life. But at that time, my concern was for Bernice. She was in her 70s, alone, and had no one to look after her," he says. And that was just what he did. In the mid-1990s, just one week after he and Bernice came home from a tour to the Holy Land with a church group, she was hit by a car and fractured her hip. She was then in her 80s, and her mobility was affected. Over the next decade, her health deteriorated. She had water in her lungs and developed a heart infection. For more than eight years, Mr Leo cleaned and bathed her, cooked for and fed her until she died a few days before her 94th birthday in 2007. Unknown to him, she had bequeathed the HDB flat to him. "I did not expect it. I was going to rent a room outside after she died. I had some savings and CPF," he says, adding: "I live simply and I believe that as long as you are hardworking and honest and trust in God, he will provide." Mr Leo now gets some income from renting out two of his rooms. The devout Catholic passes his days going to church, painting, tending to the plants on his balcony and repairing knick-knacks and trinkets for friends. The statue of the saint on the roof of the Church of Saint Michael, he says proudly, is his handiwork. A few years ago, he had sought permission to lug the weather-beaten statue home and restore it. "It was soaked through with water and damaged. So I dried it for more than a week, and then repaired it and repainted it. Nobody taught me, I taught myself." Dr Easaw Thomas, 70, got to know Mr Leo more than 30 years ago in St Barnabas Lane. He felt sorry for the man who had to sleep under a house, and would get him to come over to do odd jobs and a bit of gardening. The anaesthetist, who has three children aged between 27 and 39, describes Mr Leo as a gentle soul. "My children love him. He was like a child himself and would push them around in a wheelbarrow in the garden," he says. One day, Dr Thomas discovered Mr Leo could cook. "He is a vital part of Singapore, you know. He knows all these Dutch Burgher and Eurasian dishes, which are so much a part of Singapore heritage. His pork chop, his roast chicken, his devil curry are excellent," says Dr Thomas, who often gets Mr Leo to cook when he has guests over. "Someone should really write down all his recipes and turn them into a book," he adds. Mr Leo laughs when asked if he has ever fallen in love or thought about starting a family. "I wasn't interested in love. I was more interested in plants, how to grow them, what fertiliser to put in them." He is not lonely, he says. He has good neighbours and several friends he visits, including a Methodist priest who has asked him to live with him. "I'm not sad. I'm free. I can go anywhere I want," he says. "If one day I can't take care of myself any more, I'll go to a home, preferably the St Joseph's Home For The Aged." There is no bitterness about the bad card that fate dealt him. "Sure, I would have loved to know my parents and to have had an education, but I can't. But the Campbells also taught me a lot of things. I can do many things, I can cook." If he could live his life all over again, what would he wish for? "I don't think about these things," Mr Leo says with a laugh. "Well, I'd like to know my parents. And I would like to give my service to God and people."